Traditional dwellings (hale pili) were constructed of native woods lashed together with cordage most often made from olonā. Pili grass was a preferred thatching that added a pleasant odor to a new hale. Lauhala (pandanus leaves) or ti leaf bundles called pe‘a, were other covering materials used. 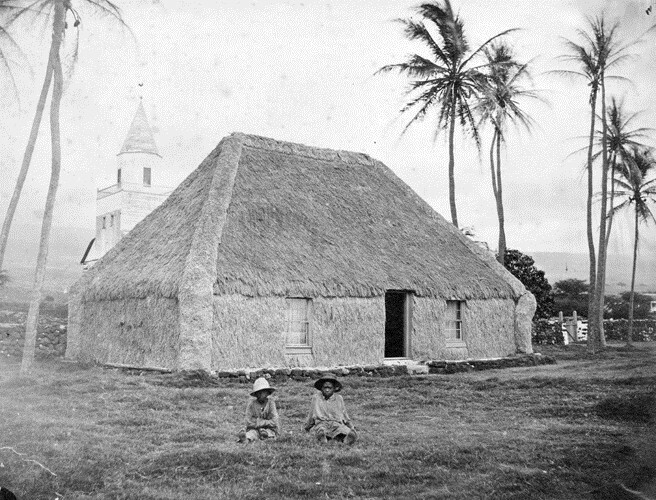 Unlike our housing today, the single ‘hale’ was not necessarily the ‘home.’ The traditional Hawaiian home was the kauhale (Lit., plural house;) this was a group of houses forming the homestead – spatially separated – each serving a specific purpose, but paired male and female activity areas. A kauhale could consist of a cluster of dwellings in the mid-elevations for cultivating food, another cluster of dwellings on the shoreline for fishing, and perhaps even more higher up on the volcanic slopes for hunting and harvesting wood products. The image shows the hale pili of Keʻelikōlani (Princess Ruth) on the grounds of Huliheʻe Palace in Kona (the style of house she preferred over the modern version nearby;) this is where she died on May 24, 1883. In addition, I have added other related images in a folder of like name in the Photos section on my Facebook and Google+ pages.